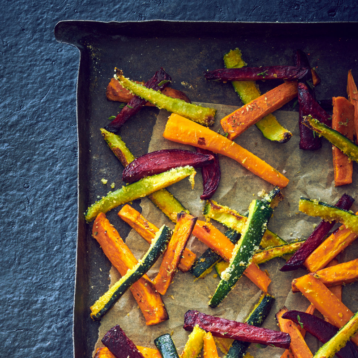 Baked vegetable frites are a great way to add both variety and colour to your meals and a healthy alternative to deep fried chips. Remove the seeded centre from the courgettes. Cut all vegetables into batons 8-10cm long. Coat in 3-4 tbsp Filippo Berio Classico Olive Oil and 1 tsp of salt before seasoning and cooking. For Beetroot - 3 minutes before the end of the cooking, sprinkle with the thyme leaves, sea salt and 2 tsp Filippo Berio Extra Virgin Olive Oil. For Sweet potato - When cooked, toss in 2 tsp Filippo Berio Extra Virgin olive oil and dried oregano. For Courgette - Before cooking, coat with the ground almonds and polenta. For Carrot - When cooked, coat with a mixture of chilli flakes and gently crushed pan toasted fennel seeds.